Given that air pollution causes about 11.2% of all deaths per year or 6.5 million deaths (split roughly 50/50 between indoor and outdoor air pollution). According to the EPA's Air Quality Index, Beijing alone suffers at the 'unhealthy' level for at least 80% of the year. CHÚcan help. The typical face mask does not filter out a lot of the harmful particulates that exist in cooking fumes and smog. The unsealed condition between the face and the mask also contributes to the issue. We went through three phases in the design of the CHÚ: (1) form, (2) material, and (3) simplicity. The first designs focus on how the CHÚ fits on the head/face. In the second round, we experimented with different materials ranging in rigidness and flexibility to allow for ease of wear. We then optimized the design in both form and material to come to a simple final prototype. The CHÚ consists of two main components: (1) tusks and (2) filter. The filter filament is housed in a cartridge that also serves as the link between the two tusks. Air is then delivered through the tusks and into the nostril. We have incorporated a silicone seal at the tips to seal and accommodate different sized nostrils. Sizing and flexibility is key for CHÚ to fit properly on the head/ face. The aft filter allows for the tusks to flex for different head sizes and eases the process of donning and doffing the CHÚ. The soft silicone tips allow for a tight fit/seal in nostrils of different sizes. When idle, CHÚ can be draped around the neck and remain as an accessory. The air intake, located at the back of the CHÚ, allows atmospheric air to enter into a series of torturous path filters and continue through the tusks directly into the nostrils. Silicone gel ring seals the perimeter space between the nostril and the CHÚ, preventing unfiltered air from entering the nose directly. Exhaled air exits the CHÚ nostril opening and purges through the one-way gill valves. The filter can be “tuned” to various geographic locations based on local pollutant types and levels. The business of CHÚ is through the subscription model. The CHÚ device can be registered upon purchase, which would allow the makers of CHÚ to curate the right CHÚ filter for your unique experience. We would recommend when new filters should be ordered and provide travel packages geared toward your destinations. CHÚ was produced in collaboration with Kathrine Spies as part of the Masters in Design Engineering Collaborative Studio at harvard gsd and seas. The U.S. healthcare system is massive, populated with many constituents from all angles, while leaving the patient as a passive subject. Many people whom we had surveyed and interviewed have expressed the issue around non-integrated system for their healthcare data. Part of the issue lies with HIPAA - mandating that all healthcare data should be owned by the healthcare provider, while allowing the patients to request a copy for their use. This leaves many of us with scattered health data which may lead to high amounts of wasted administrative efforts and patients' time as well as increased misdiagnosis and unnecessary treatments. Larry is 45 years old and currently lives with his husband and two daughters in Oklahoma City. He is originally from Portland, Oregon, but because of a promising job opportunity, he and his family made the moved to Oklahoma about 5 years ago. Two years in, Larry was laid off and had to change professions. He now spends his 9-5 as a construction manager. And six months ago, he was diagnosed with high blood pressure. Larry, along with his husband, has spent countless hours tracking down past medical records from multiple different doctors and specialists in both Portland and Oklahoma City. Some of the records are electronic and difficult to obtain, while others are physical documents and stashed away in the attic. Larry’s doctor, like many doctors in America, finds it easier to re-order tests rather than piecemeal together a health history from multiple different providers with multiple different input formats. Problems like these are the result of systems built over time for a rapidly growing and diversifying America. This layered buildup in the healthcare space has created a system that is complicated for both the user, and providers, to navigate. Individual healthcare data is dispersed and difficult for Larry and his family to leverage into individual holistic health outcomes. They have wasted a lot of time, money, and energy and still aren’t receiving comprehensive care. Create a system based on user-owned health information, where individual data can be utilized for holistic, personalized health outcomes. OMNI INDI provides Larry and his family the platform and infrastructure to manage, secure, and advance their health data for improved health outcomes. OMNI INDI allows users to collect personal health information including: (1) clinical data - doctor's notes, x-rays, lab reports, etc., (2) personal tracking - fitbit, wearables, self-input data, and (3) environmental data - air content in a geographical location and in indoor spaces. OMNI INDI uses a light block-chain model where the health data is stored in an unstructured (non-folder) manner while the identity and data locator are both stored in the block-chain. This means only authorized users are able to put both the identity of the user with the specified health data. OMNI INDI not only provides the platform for users to share their data with healthcare providers to improve their personal health outcome, but it also provides an infrastructure on which they can choose to either sell, invest, or donate their data to the larger research community to benefit the health outcome of others with similar health conditions. In all cases, because the users now own their health data. they are able to see and control who has access to their data and determine the duration of viewing privileges. We have produced a multi-agent economic simulation between the users, healthcare providers, researchers, data miners (those currently selling our health data), and insurers. Through this simulation, we see how all parties except the data miners can benefit from a model like OMNI INDI. The aim of OMNI INDI is to simply healthcare through a user-owned health data leveraged for better health outcomes. omni indi was produced in collaboration with Kathrine Spies, Vivek hv, and saif haobsh as part of the Masters in Design Engineering Collaborative Studio at harvard gsd and seas. Our proposal titled “27 Steps” is a walk for Mandela – a walk for peace. The pavilion is a walk of twenty seven steps. Two pyramids open the gateway to this path. The void stands for how Mandela inverted the political pyramid by cultivating a culture of forgiveness. By night, it becomes a lantern of hope to commemorate the Purple Rain Protest against apartheid in 1989, just months before Mandela was released from prison. As part of a traveling pavilion, can an art piece be utilized to measure the interactions of a space? Market Street, the central corridor of San Francisco, varies in its use throughout the day and week. Users ranging from morning commuters, curious tourists, and leisure passerbys, roam the street at different densities and patterns. For the prototyping festival, the first urban metric is density. We set up a motion sensor as well as a time-lapse camera to document these movements. Just as Nelson Mandela had traveled the world in pursuit of spreading peace, one of the goals for this pavilion was to also have it travel throughout a 12-month period. Beginning at the Palace of Fine Arts (where we had first assembled it), the pavilion traveled and was exhibited at a number of locations across downtown San Francisco before returning to the Palace of Fine Arts for a final exhibit. We were invited to exhibit the 27 Steps Concept Board as part of the California College of the Arts Alumni Exhibit in November 2016. For this exhibit, there is an addition of three speakers through which three different voices of different ages narrate each evolution of the project: (1) Memorial, (2) Pavilion, and (3) Shelter. team: will giovacchini, grant ryan, gabriel larsen santos, craig stiles, kevin ju, steve pepple, stephanie geerlinger, aurelia freidland, adonis gaitatzis, and the innovation hangar team. Gastronomy is the study food, ranging from the preparation of, serving of, taste of, experience of, and science of food. Since the earliest food processing of wheat into bread (ancient time), food as well as the science of food have been a part of human culture. Today top chefs, such as Ferran Adria, have taken risks through molecular gastronomy, merging both chemistry and physics at the granular/ molecular level to produce new textures, tastes, and unexepected sensations in food. We look to add to this growing food vocabulary. Gels are composed from two interacting ingredients: polymer and cross-linker. Polymers are often confused to be gels, but they are simply the thickener part of the gel. The solidifying process comes when the cross-linker binds (in our case, ionic bond) with the polymer. For this experiment, we tested four different edible polymers to see which of them are the most voluminous: gelatin, sodium alginate, pectin, and carrageenan. After selecting sodium alginate as our base polymer, we looked into its crosslinker - Calcium. The pancake mix we had used to do our first analysis of the ingredients contain some calcium, hence the gelling effect as seen on the photo above. Below is a diagram showing how the strings of alginate come together via the attraction to the calcium ions. The longer the sodium alginate is exposed to the calcium bath, the stronger the gel as the crosslinking increase in complexity. For our experiment, we later used calcium lactate (for its more mild taste than calcium chloride). Inspired by Willy Wonka's three-course-meal chewing gum, we experimented with creating nesting sphericals (hydrogels) with different flavors. The process consists of an alternating bath between the sodium alginate and calcium baths. In this iteration, we had blended the flavoring with the sodium alginate baths with natural ingredients: chocolate chips (inner-), pomegranate (middle), and cucumber (outer). With the goal of creating a new culinary experience latent and our vast knowledge of edible hydrogels, we decided to pivot towards creating a unique edible experience. We successfully nested different flavors by using hydrogels to create layered textures with encapsulating appealing tastes creating an entirely new culinary experience; we call it Matryoshka. Our future work would consist in both, developing tastes that could enhance as much as possible the product and developing the experience into a multisensorial space where the room, sound, colors and smell would influence the moment. matryoshka was done in collaboration with berto ceballos AS PART OF THE MASTERS IN DESIGN ENGINEERING elective AT HARVARD GSD AND SEAS. Water is life. Given that most of the human body as well as the Earth's surface is made of water, can water be the treatment in this spa? A 250-foot-long shower corridor links all of the facility's amenities: housing (rest), clay bath (therapy), and pool (swim). A chamber dedicated for the washing of the body --an experience between hot and cold showers as one walks along the 250-foot shower. A water tank. If water is the focus, can we also rethink the domestic space and curate that around the bathing scene? Can we use the bathroom as a threshold to another space (the shower corridor)? The three energy sources are solar, biofuel, and ground-source heat pump. The diverse sources of fuel work in tandem with the local climate. To sustain annual energy demand, the water plenum is sized to store solar energy (with water as the medium) and to recharge ground-source heat pump. blue spa was done in collaboration with Nish Kothari as a competition proposal for a design of a blue clay spa in latvia, 2016. The stock exchange has been a barometer of economy and progress for the last few hundred years. Hidden behind the ups and downs of the stock price are the stories of human progress and failures. Bill Gates, Warren Buffett and Steve Jobs have used the capitalism model to advance human society. However, the capital distribution remains a barrier, the problems of high disparity has resulted in deep social crisis. We have all agreed to resolve the issue in this century. Perhaps an equal distribution of knowledge may solve the unequal distribution of capital. Library as institutions have been the venues to go to for knowledge. At the great Alexandria library in 3rd century BC and in Francois Mitterrand's The National Bibliotheque of the 20th century, the main protagonist was and is the book, in paper and in bits. The program of the library has not changed much from then until now. A linear function of a library acting as a missionary of knowledge may not serve the new millennia well. The old program of a library is relevant for solo readers. But the new world operates in groups. What and where is the new waterhole for knowledge? A knowledge exchange building is a place for a dialogue, the focus shifts to the seeker, the books and bits are the props. It is a building where books, digital servers and a town hall co-exist together in a park. Between two knowledge sources is a forum setting which allows learning by sharing and a place to protest, contest, agree. This is a place to collaborate, to use new resources, build partnerships, charter a new course for progress. Sited in cities left behind by the market economy, these exchange buildings provide free tools to compete and claim its share of the capital. The building is the new venture, the knowledge seekers are its capital. St Louis is where we seek to build the Knowledge Exchange. City air make you free as they used to say in medieval Germany, so we ask- can St Louis free itself of its issues of economic disparity, population loss and crime? We introspect, a Knowledge Exchange may help the coming together of discussions, differences and communities. As architects, we often look onto our buildings as an extension of an ideology we believe in. We are excited about the Knowledge Exchange and we urge you to get involved in this mission. Our objective of creating a change is aligned with the vision of the words of Mr. Barrack Obama, "I'm asking you to believe. Not in my ability to create change — but in yours." As an advisory member of our team we will seek your guidance, hope and wisdom. We cannot do this alone, so we thank you in advance for your participation. As they say, “If you build it, they will come”. KNOWLEDGE EXCHANGE was done in collaboration with NISH KOTHARI AS aN IDEA PROPOSAL. Creativity can be defined as the ability to associate concepts and abstract thoughts to generate new and unique ideas. Scientifically speaking, humans have 5 brainwaves (delta, theta, alpha, beta, gamma) --each corresponding to a different state of mind. Although there is no unanimous conclusion, many researchers have found that alpha waves are associated with creativity. Researches have been able to elicit creativity by deactivating the left dorsolateral prefrontal cortex in the brain, which is also found to be associated with an increase in alpha waves. Atelier combines VR technology with two technologies into one powerful mechanism. An electroencephalography (EEG) is a monitoring device which uses electrodes (placed along the scalp) to measure the voltage fluctuations resulting from ionic current within the neurons of the brain over a period of time. An electrooculography (EOG) is a recent technology that also uses electrodes (placed on the face around the eyes) to track the position of the eye based on a voltage difference from the cornea. In both cases, we were able to gain feedback data with which we use them to align and understand the effects from the visual stimuli we showed on the VR headset. The goal of Atelier is to induce alpha waves through three phases. In the (1) Diagnostic phase, the individual is exposed to a variety of imagery. Atelier tracks and catalogs what the eye is seeing when the individual's alpha peaks. Given this catalog of imagery, in the (2) Optimal Alpha State, Atelier composes an environment based upon the patterns and common characteristics of the cataloged images. And finally in (3) Transition to Reality, the individual is slowly transitioned back to his/her real surrounding and the therapy session ends. This process assumes that we often are unaware of the things that spark our creativity and by approaching this through an objective lens, we can better identify that unique creative environment for each person. We hope that through multiple sessions, an individual can reach that peak alpha level state much quicker, hence increasing creative productivity. The design of Atelier consists of two main components: (1) the 'brain', which houses the sensing and computing mechanisms, and (2) the stimuli, which holds the mobile VR headset. Atelier is catered to the individual, it is portable, and it is scalable as a manufactured product. Companies within the creative industry have already spent a lot of effort in changing the workplace environment to increase creative productivity. These efforts range from low to high capital intensiveness and from physical to non-physical manifestations. Atelier fits in this matrix as being both capital sensitive and portable. ATELIER was produced in collaboration with VIVEK HV, JULIAN SEIGELMANN AND KENNETH SO as part of the Masters in Design Engineering Collaborative Studio at harvard gsd and seas. In Canada, 486 invasive plant species exist, several of which were introduced during the colonization period of the 1800s for ornamental purposes — to create gardens. Ironically, it is the success of these plants in flourishing in non-native environments that now makes them a threat. Simultaneously, several of these ‘alien’ plants have resided in Canada longer than Canada’s own formation in 1867. Our proposal produces a living archive of 22 of the earliest invasive plant species to Canada that were intentionally introduced for their beauty. Organized within a tensile structure that allows each of these species to hover behind a transparent veil, these plants are separated from the ground below where they could pose a threat. As the festival continues through the summer, these plants will develop and their weight will pull them closer to the earth — the tension of the flexible portico structure aligning with the tension of the approaching species. In plan, the proposal forms a threshold — an outdoor room for relaxation, contemplation, and admiration of these species while framing the context beyond. Our garden celebrates these species by allowing people to interact with them and re-positions them as a part of Canadian culture. garden of displaced roots was done in collaboration with cesar lopez and neeraj bhatia (the open workshop) as a competition proposal for the jardin de mÉtis exhibition in quebec, canada, 2013. Is our country focused more on fixing our problems or on preventing our problems? Inspired by the way the U.S. healthcare is portrayed in Matthew Heineman and Susan Froemke’s documentary “Escape Fire,” the purpose of this study is to analyze the global pharmaceutical industry and gauge where the emphasis on funding lies between therapeutic and preventive methods in our health. The intended audience is a mix of governmental leaders, related R & D start-ups, and curious global citizens who care about the trajectory of their healthcare system. The following data is based on a small sampling of the currently(2017) active pharmaceutical companies around the world. About a 10% random sample were taken from each bucket of different sized companies (measured by the number of employees). This data was obtained in 2017 through the Orbis Database, the World Bank Data, and the Bloomberg Global Health Index. Looking at the last diagram, where the companies are simply sorted by their amount of funding regardless of their base countries, we can see that toward the higher end of the spectrum, we see that there are a greater density of companies focused around preventive care. A possible extension of this study would be to do a similar spread across different years and see if it's changed throughout the years or not. As one infrastructure becomes obsolete we must seek to convert it to better serve its contemporary context. With the rise of mobile devices and the growing wireless urban-scape, the demand for data storage will inevitably increase. Information Week Analytics State of Storage Survey shows that data storage capacity would need to double in every two or three years. As data continues to reach greater significance, we must re-imagine their integration and role within our current urban fabric. Data centers use about 1.5% of all U.S. electricity consumption. Sited on San Francisco’s Mission Creek, DATA FARM sees the potential of using the Bay water to interchangeably cool the data tubes. Heated water returning from the data tubes would then be supplied to the neighboring buildings. San Francisco’s wet winters allow DATA FARM to harvest rainwater and dew within vertical tube reservoirs as additional water supply for the cooling system. In the attempt to reconnect the digital with the domestic, DATA FARM couples the virtual realm with agriculture –digitalizing and globalizing urban farming. As many of the country's freeways are being demolished, trees of columns are left behind as vital resources for urban data centers. Public space must now integrate social activity of all realms – where productivity and society engage. DATA FARM harvests crops, data and water as it synthesizes a space that is both physical and cloud-based. DATA FARM activates underutilized space as it restores ¬contextual relationship while preserving a layer of the city. 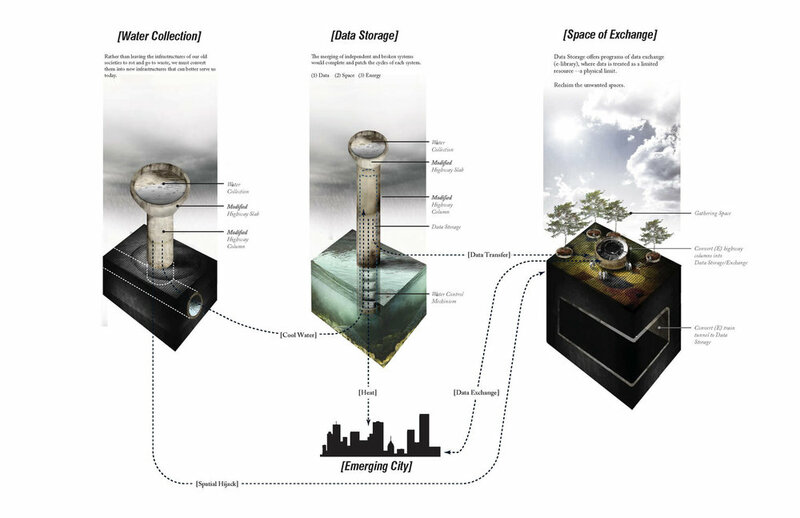 data farm was done in collaboration with cesar lopez AS a competition proposal for the removal of the i-280 in san francisco, 2013.